Growing up in Canada as a first generation Canadian, born into a family of immigrant parents, one is raised with a profound level of gratitude towards this young, diverse, caring, and inviting democracy. I also have a responsibility to maintain that openness for future generations of newcomers so that they may contribute to the vibrant Canadian mosaic. Canada is a country where you feel that opportunities are at hand, within reach, regardless of your ancestry. Your background does not matter; we have embraced a rich citizenship and identity. What Canadian is not proud to carry that Maple Leaf passport, or travel abroad and discreetly flash that Maple Leaf on a personal item? This sentiment is rooted in the nation’s rich history and achievements. Our citizens are leaders in strengthening communities as peacekeepers, serving in the army, innovating in medicine and science, and showing prowess in sports. Learning our country’s achievements and thereby strengthening our citizenship allows us to simultaneously respect and honour our diversity, yet coalesce as one people in one nation. I, like many Canadians, have better understood our history and citizenship through well-narrated stories broadcasted on television and in cinemas, called Heritage Minutes. The success and appeal of these vignettes did not happen by chance, but through the work of two of Canada’s greatest citizens: Charles and Andrea Bronfman. In 1986, Charles Bronfman and his late wife Andrea created their foundation. In the near 30 years of its activity, it has made a major contribution to Canadians through its initiatives to raise awareness of the country’s history and heritage. The Government of Canada has been a partner of the foundation through much of this time. 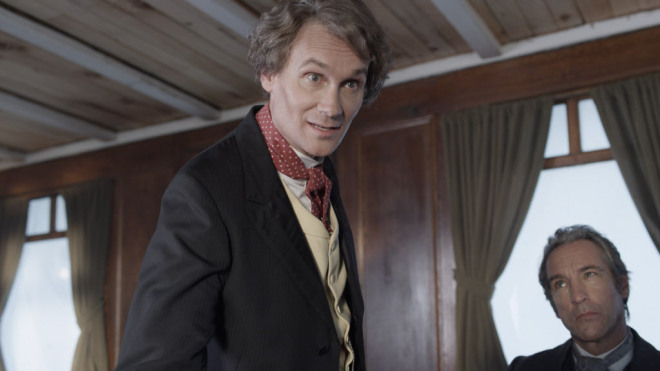 In a scene from Heritage Minutes, Sir John A. Macdonald discusses confederation. Photo credit: Historica Canada. In 1991, the foundation created the Heritage Minutes – les Reflets du patrimoine – sixty-second clips for television and cinemas. Independent production companies hired through the Bronfman’s generosity created these of Canada, some on a small scale and others national in scope, but all important and most little-known. The vignettes were made available for free use and qualified as Canadian content for public programming purposes. Heritage Minutes was a part of the Heritage Project, which produces a variety of learning materials, in both English and French, for use in schools but with appeal beyond the classroom. The foundation funded three pilot Minutes. The programs were of high quality, supported by historical research and professional production with well-known actors. The foundation then sought partnerships with likeminded groups: broadcasters, school systems, corporations, and several departments of the Government of Canada. The Heritage Project developed into a multi-faceted project that encompassed Heritage Minutes, Heritage Fairs, where young students could present stories of Canadian history of their choice, learning materials, and summer institutes for teachers. At its height, the Minutes were shown in cinemas across the country and on nearly every television station. Some of our embassies used them as a way of promoting Canada abroad. Since 2000, the Minutes have been part of the programming of Historica Canada, which, with federal support, continues to produce new Minutes. There are now 75 Minutes, with two new ones launched this year as part of the celebration of the country’s 147th year. Subjects this year included Sir John A Macdonald, our first Prime Minister, and Sir George-Etienne Cartier, who brought what is now the province of Quebec into Canada. The Government of Canada supports a wide variety of programs and projects with the aim of enhancing Canadians’ awareness of their country. The opportunity to join with a private foundation created by one of our most public-spirited and community-minded families with a strong commitment to nation building has benefited Canada. It has been a special experience to see the extent to which the Minutes captured the popular imagination, and continue to live in the universe of social media where they are the subject of affectionate spoofs and the focus of chat groups. Canada’s richness and prosperity is a direct result of its people. Charles and Andrea Bronfman understood this well and they have both contributed to the building of the Canadian mosaic. Through their generosity and commitment to measurable outcomes they have been innovative in their philanthropic activities and in seeking partnerships. They did it for their love of the country and its future. Ultimately, we as a nation and future waves of Canadians, are grateful for their insight and devotion. John Prato is the Consul General of Canada in New York. Previously he worked as a Managing Director in the Equity Capital Markets (ECM) group at TD Securities, the investment banking division of The TD Bank Financial Group. As a member of the ECM group since 1998, he was also responsible for senior client coverage of a wide variety of leading Canadian companies. From 1996 to 1998, Mr. Prato worked in merchant banking with TD Capital Group Ltd. with a variety of mandates, including private equity, mergers and acquisitions, leveraged buy-outs and early-stage investing. Mr. Prato has served on the Board of Trustees of the Royal Ontario Museum, and on the Executive Committee of that Board. He currently sits on the boards of the St. Michael's Hospital Foundation, the Canadian Foundation for AIDS Research and CommunityLend Inc.